The Delhi Police Special Cell bust an international drug racket and recovered 5.250 kg high-grade heroin worth Rs 21 crore in the international market. The accused have been identified as Chigemezu alias Obiji, a 27-year-old Nigerian national, and Deepak Goel (28) and Harinder Pal (21). Obiji, who currently residents in Uttam Nagar, is the kingpin of the gang. 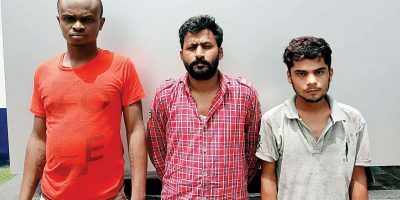 On Sunday, the Special Cell received an information that at about 6 pm, Goel and Pal would come from Rohini side in a Skoda car and would go towards Singhu Border via Mukarba Chowk to deliver consignments of heroin to drug dealers. A team was constituted and a trap was laid and checking of vehicles was started by placing barricades near Mukarba Chowk. At about 6:30 pm, the car in which two persons were sitting was spotted. The driver was signalled to stop the car, but he tried to escape by taking a U-turn but he could not succeed. Finding themselves surrounded by the police, both the occupants of the car started running to escape, but they were apprehended by the members of the raiding party. Their search was taken which resulted in the recovery of 4.5 kg heroin. “During interrogation, they have disclosed that they used to source heroin from Obiji, their Nigerian associate, and they further used to supply heroin to drug dealers in Haryana and Punjab. Accused Goel disclosed that about 2 years ago he was lodged in Patiala jail in a narcotic drug case where he met Obiji who was also lodged in that jail in another narcotic drug case. After getting bail, Goel contacted Obiji who had also come out from Jail. Goel started procuring heroin from Obiji. Goel has been indulging in drug supplying for more than five years. Pal who usually acted as a carrier has been indulging in drug supply for more than two years. During this period both have already procured more than 80 kg heroin and have supplied the same to various drug peddlers in north India,” said PS Khushwah, DCP (Special Cell). On Goel’s instance, raids were conducted in various parts of Uttam Nagar and Obiji was arrested on Monday and 750 gm of heroin was recovered from him. Deepak Goel has been indulging in drug supplying for more than five years. Pal who usually acted as a carrier has been indulging in drug supply for more than two years. During this period both have already procured more than 80 kg heroin and have supplied the same to various drug peddlers in north India, DCP, PS Khushwah said.